All tickets have been sold for this visit, select ‘Waiting list’ if you want to be contacted should any tickets become available. Wiltshire is lucky to have many beautiful houses and gardens both large and small. The three we see are all manor houses and therefore smaller and private. Arrival will be at 10.00 am for refreshments. There is a lot of topiary, both box and yew including an old cloud box hedge believed by some to date from doomsday. From a charming courthouse the garden can be seen, full of bulbs, trees, lawns and topiary, all with a beautiful view. The owner, Lady Nutting, a member, who has kindly agreed to open her garden for us, will show us round. The Manor House, West Lavington is our next garden. It was established in the seventeenth century by John Danvers who brought Italianate gardens to Britain, following his Grand Tour. 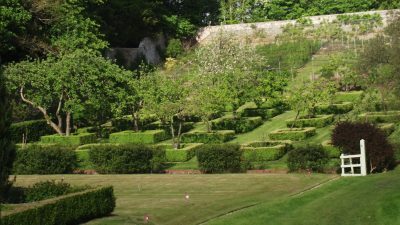 A wall entirely encloses the five acre garden, which is divided into a naturally flowing range of areas, providing many vistas with surprises around every corner. There is topiary, shrubs and a Japanese garden. Each tree in the orchard is enclosed by a square, neatly clipped hedge, producing an intriguing chequerboard effect. Our thanks are due to the owner, Andrew Doman. After lunch at the Three Daggers pub, Edington, we depart for The Old Vicarage, Edington, Westbury. The owner, John d’Arcy will open his normally private garden for us, for which we are grateful. The garden is not a topiary garden but for all gardeners a demonstration of how the difficulties of its site have been overcome. The three acre plot is half way up the escarpment of Salisbury Plain, facing west and north. The soil is green and light and workable but prone to drying out. Wind has been the main enemy. Brick walls have been built and many trees and shrubs have been planted with herbaceous borders and gravel areas. There is a magnificent view to the north through an avenue of fastigiate hornbeam, now 50 feet high and another towards the church, partly framed by a steep grassy chalk hillside. A number of botanical expeditions by John d’Arcy with fellow explorers to China, Mexico, Argentina, South Africa and Korea have added to the range of species particularly Mahonia, Acer, Berberis and Paeonia. The final visit of the day is to Courthill House, Potterne, Devizes, a private garden lovingly created by Janey Ewart with an abundance of plants, including topiary. She will be our host for our visit and will be able to answer members’ questions. We will leave after tea and cakes. With many thanks Lady Nutting for making the arrangements for our visits and lunch. She hopes that it will be a joyful day .